I grew up in Lexington, Massachusetts, a town we proudly called the “birthplace of American liberty.” Every year we celebrated the ride of Paul Revere. Every year, as young children, we watched the parade, waving American flags, and took in the reenactment on the Lexington Battle Green. Every year, now, my father and brother dress in their Minutemen uniforms and carry their muskets for the battle at first light to acknowledge April 19, 1775. Every Patriots’ Day was our holiday, not celebrated as much around the country. 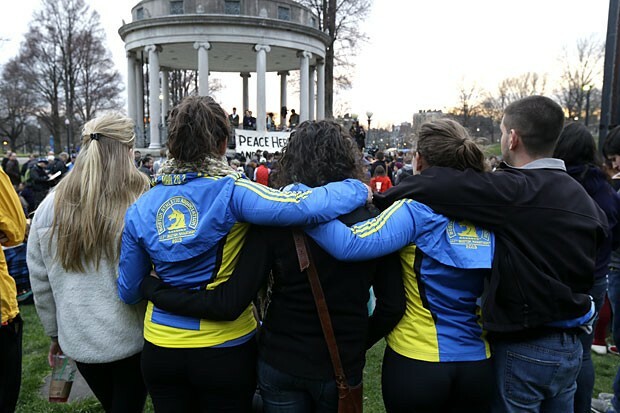 And every Patriots’ Day there was the Boston marathon, growing in popularity, as I grew up. Over a half million spectators and nearly 30,000 runners, now, it is the world’s oldest marathon, established in 1897. It is all a celebration routed in the history of our country and the pride of a region. It is a happy time, a holiday all of us growing up there could not wait for every year. Now, we mourn and we pray and we cry. We are shaken and we see fear and we feel pain for those who suffered so brutally. But we know, deep down, what this holiday Patriots’ Day means – it is a testimony to our strength of character and our resolve, to stand together, to stand as tall as we can, to celebrate a unity of purpose and a kindness of spirit. The agony of an unspeakable act is far overshadowed by the courage and compassion of all those who rose up to help and to comfort and go into harm’s way. In the hour of darkness and peril and need. The message is one of freedom and forbearance, liberty and light, kindness and compassion. That is Patriots’ Day; that is the world’s oldest marathon. Through it all, we should remember that.